“Bestseller Alan Jacobson’s sixth Karen Vail novel is his best work to date. 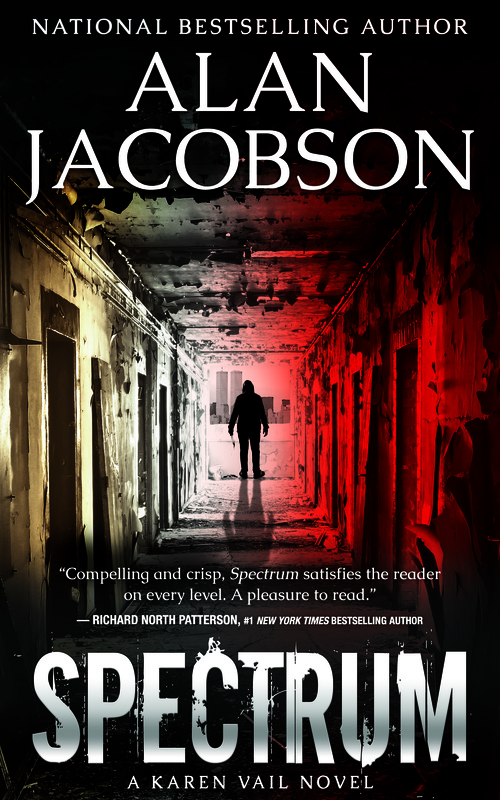 SPECTRUM is an epic origin story that spans decades, tracing not only Vail’s path from rookie cop to top FBI profiler—but also the makings of the killer she’s been tracking for nearly twenty years. …Longtime Vail fans will relish in learning about her early years to say nothing of how Jacobson seamlessly weaves in references to cases from past Vail novels. At the same time, the book is a great entryway for newcomers to the series, since it provides a full picture of the beloved Vail in a story that stands alone. As always, Jacobson’s research on law enforcement procedure is impeccable and brings an authenticity few can match. But in SPECTRUM he also crafts a period piece, vividly taking readers on a journey from 1970s New York to the haunting events of 9/11 to present day. Just when you think you know how it will end, Jacobson throws in a shocker. Without giving anything away, it is fitting that it took Vail’s evolution—her two decades studying the human mind—to bring a resolution to the Hades case. SPECTRUM is as ambitious as it is exceptional.